Happy Friday Evening... more like night but I don't want to be picky :). It is time for another Friday Mashup. Make a "Fall themed" project (it's right around the corner, people!). Or Make a Project that uses "Brads...lots and lots of Brads". Or "Mash it Up" and create a fun "Fall themed project that uses lots and lots of Brads". Ohh how I love Autumn, Lisa said it in such a nice poetic way - see her description on The Friday Mashup Blog. I think when you love the subject it is easier to be creative. 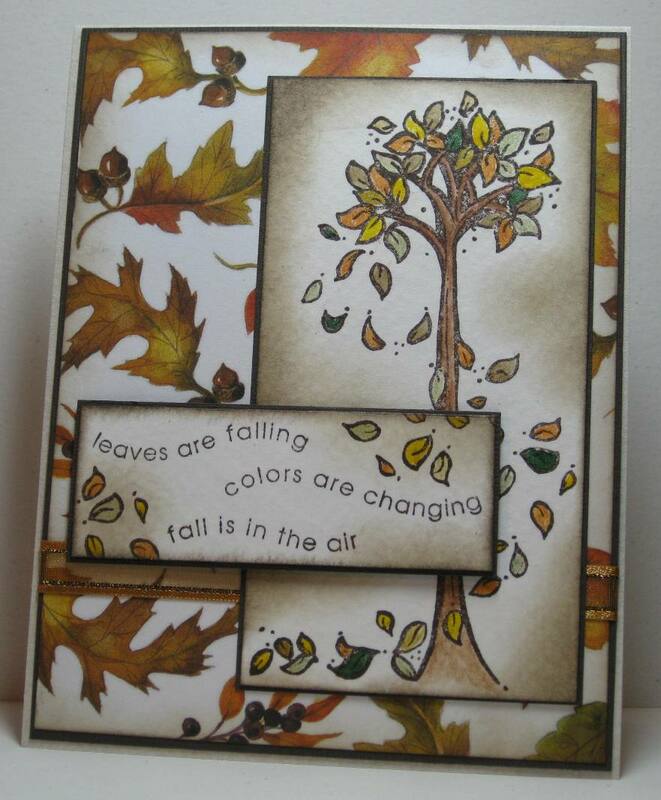 I used 5 or 6 different "Fall" colours Stickles to make the leaves in the wind and a few remaining on the tree. 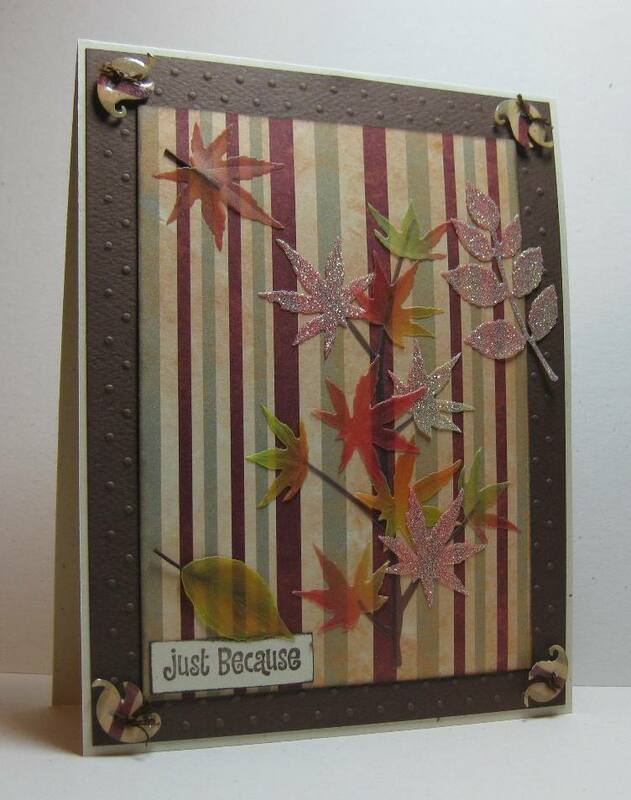 I used a Color Box Option Pad for the Fall Colours stamp, then embossed with clear embossing powder. I used the same ink pad for the leaves under the large brad. I finished with a mini brads in the two corners. Supplies: Cream and Brown Cardstock, Designer Paper-My Mind's Eye, Penny Black-Snow Dust, GStudio-Halloween Harvest, Making Memories brad, Recollections mini brads, misc ribbon, Martha Stewart punch, Stickles. I have a ton of comments to return, that will have to wait till tomorrow. Night All. Time for a new Freshly Made Sketches challenge, I thought I would try a Christmas themed card. It took me a little while as I re-worked it a couple of times but in the end I am happy with the card. I may have used a few too many layers, then again when don't I :). I was also generous with mini snowflakes and wee little gems too. Supplies: Natural White and turquoise cardstock, Designer Paper-Memory Box, Fiskars-Winter Wonderland, JustRite- Deck the Halls, misc gems and ribbon. Although I was happy with my onsie card from the other day, I kept having other ideas. For the first time in a while, I had one of those ahh ha card moments. Have you ever had one of those ideas that just does not want to go away till it is made. This card is one of those. There have to be a half a dozen book covers for What to Expect when Expecting. I figured this one worked for me. Supplies: Natural White and brown cardstock, Designer Paper-Scrapbook Walls, Spellbinders die cut, misc book cover, Hot off the Press- Tiny words, misc ribbon, Kaisercraft pearls. Good Evening, it is stormy outside my window so it is a fantastic time to Mojo Monday. This was my second attempt at this card, I was determined to do a Christmas card and I ended up abandoning the first one. I think I might try and finish it but I did needed to go in a different direction for this one. I am happy I did, as I really like the way it turned out. When I struggle it seems I always fall back on my stash of Memory Box DP, it always seems to come through for me. 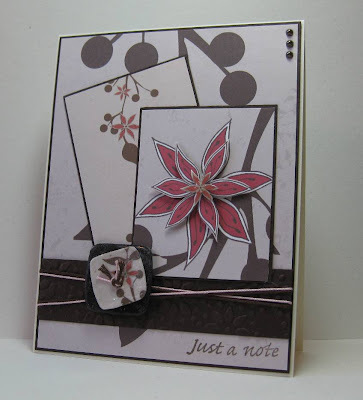 I am drawn to the 6x6 paper packs so maybe that it is easy to mix and match that helps me along. I left the Christmas bulbs simple and only enhanced small areas with one of my Clear Star Gelly Rollers and small silver bow. I finished with many little diamond gems. Supplies: Natural White and brown cardstock, Designer Paper-Memory Box, JustRite-Deck the Halls, misc mini gems, misc silver twine. I also want to thank Sarah for a Leibster Blog award. This award recognizes inspiring blogs with less than 200 followers, I am far far away from having this many follows but it sure does the creativity wonders to know that I have inspired some one with my cards. I have soo many people that inspire me but for the most part they have way more then 200 hundred followers so for this award I will stay with the ladies close to my heart. Barb, Valinda, Samantha, Judy and Neti – and ladies we know we inspire each other :). I cheated and chose family so I dare you to spread your award wings and choose someone else to honour. We have had crazy weather here today, right now it is sunny and beautiful but we have had nasty wind and rain too and the two seem to switch it up in an instance. Anyhoo, I made this card for friends of ours who are expecting their third child. This card may be more suited for after three’s arrival but I made it for Congratulation on expecting. The Clean and Simple Stamping Challenge worked perfect. I actually was able to accomplish both clean and simple with this card. The Onsies are embossed using Concord Grape ink and clear embossing powder. I did add some texture to the squares and lower have of the card. I finished with some purple velvet ribbon. Supplies: Cream and purple cardstock, Designer Paper-Basic Grey, There She Goes Stamps-Bit of Stardust, Inkadinkado-Congratulations, Cuttlebug-Embossing folders, misc velvet ribbon. It is a beautiful day here, it started off foggy but the sun has come out. We get the most bizarre patches of sea fog that drift in off the water through and the temperature can drop very quickly. It was a perfect morning for the 5KM Fun Walk that I participated in, I am pretty proud of myself making it over the finish line in a little over 37 mins. I did not get The Friday Mashup done till later in the evening last night, I wanted to wait for some natural light for my picture. Here are the details for this weeks challenge. I made this for my son, who is almost 18 so has not gone out Trick or Treating for years but he does have the honour of giving candy out to all the munchkins that come by our house. I will usually pick him up something special of his own so he does not raid too much from the give away candy bowl. I roughed up some of the edges, added a little texture here and there and finished with some spiders that had me humming Incy Wincy Spider all evening. Supplies: Cream and gray cardstock, Designer Paper-Recollections, Stampendous-Pumpkin Plaque, Jolee’s Boutique, Cuttlebug embossing folder, misc ribbon. I have a ton of comments to return then I think I might try another card. Where has my mojo gone? Have you ever really really wanted to craft only to have your creative juices dry up. *Sigh* this has been my week for missing mojo. I think this is my third attempt for this challenge and I am still not totally happy with these results. 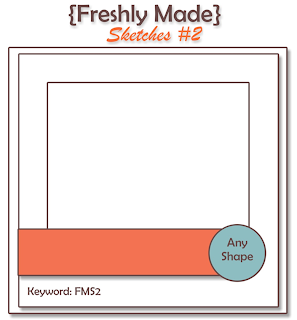 Another fabulous sketch for Freshly Made Sketches #3. I brought some Antiquities Frosted Crystal recently, and was determined to try it so I glassed the entire Winter Cabin image and snowflakes. 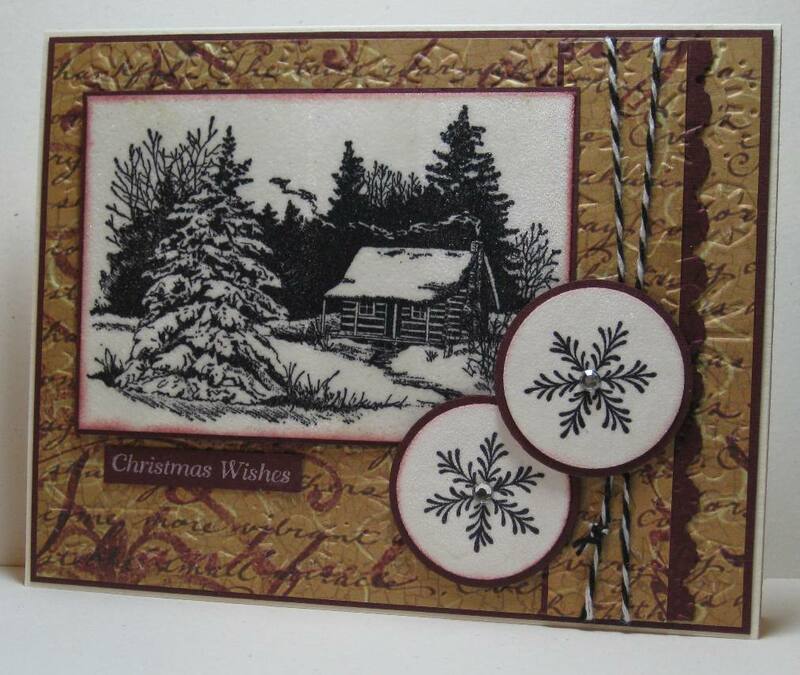 Supplies: Cream and Burgundy, Designer Paper-K&Company, Penny Black-Whites, Inkadinkado-Winter Cabin, Just Right-Deck the Halls, Misc Circle and Edge Punches, Cuttlebug embossing folders, Black and White twine, diamond gems. Good Evening - A quick challenge post for Clean and Simple Sunday Challenge. I have rarely met a woman who does not like chocolate, this is for a friend who needs a daily intake. The chocolates are embossed with Bronze embossing powder. 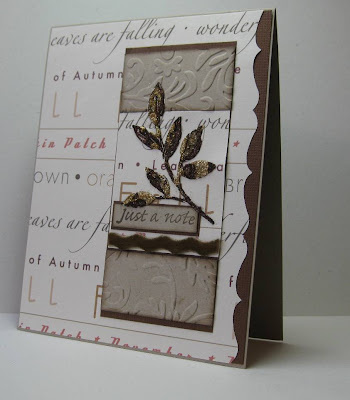 Supplies: Cream and brown cardstock, Designer Paper-Stampin' Up!, Gel.a.tins-Chocolate Bliss, Hot off the Press- Tiny Words and Images. Welcome to a new week, and a new Mojo Monday Challenge. Well I was trying for masculine and I think I pulled it off, I have lots of layers with texture on most and all dark and mannish colours. 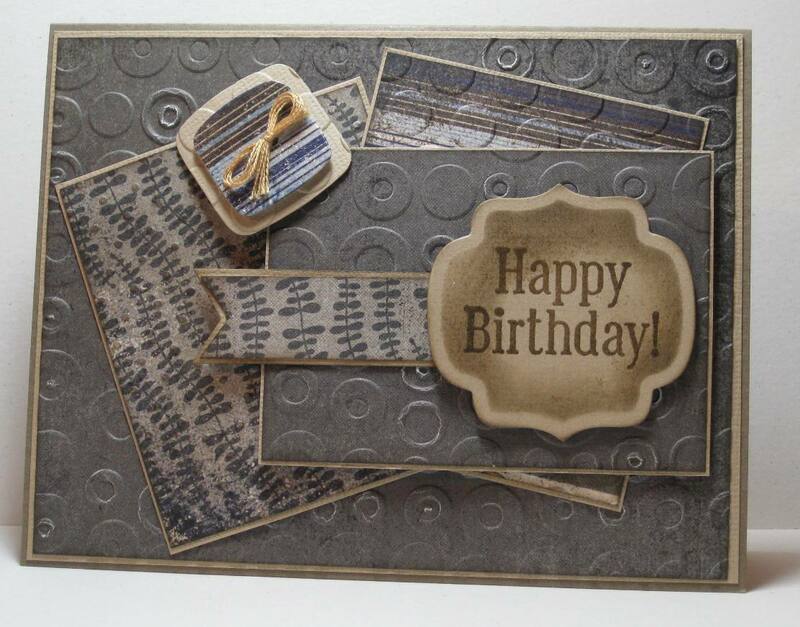 Supplies: Brown and cream cardstock, Designer Paper-Basic Grey, TPC-Card Crafting Happy Birthday, Spellbinders die cuts, Sizzlets-buttons, Cuttlebug embossing folders, embroidery thread. There was a craft exchange today, I was not going to go but it called to me. There was some fabulous items there, I found a few of them :). 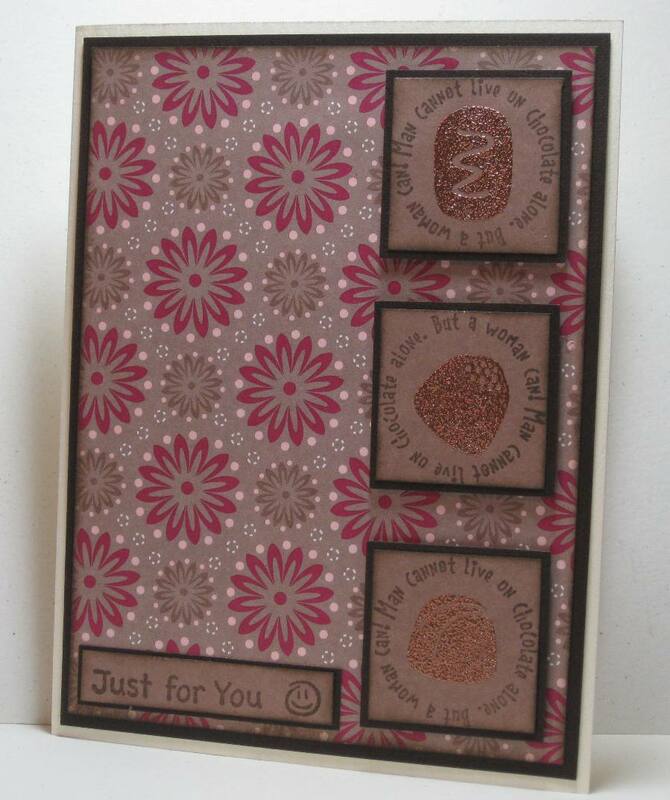 This very pretty gift box stamp and embossing folder are of couple of the items. Anyhoo. 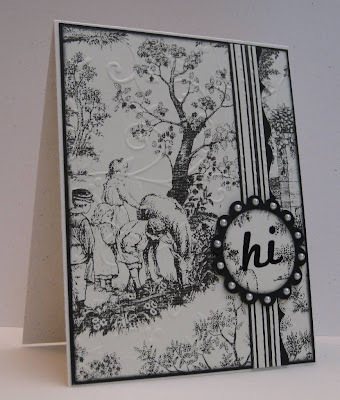 I have a purpose for this post, it is Clean and Simple Stamping challenge 158. I am only going to share a few details of the making of this card because then you would know I went the Clean and Complicated route rather than the simple one.﻿ I have layers as per my style, I added a little texture, a little embossing powder and well maybe a little Diamond Glaze. Supplies: Cream and burgundy cardstock, Designer Paper-Cloud9Design, Unknown gift box stamp, Hot off the Press Tiny words, Tim Holtz-embossing folder. Ahhh... Friday I have missed you so. Even though it was busy at work today, I still had time to count the minutes down to ME time. Don't get me wrong I like my job but there is sooo many other things I could happily be doing. One of those things... The Friday Mashup :). I am so pleased, I made Glamette. What a fabulous honour for one of my little mini canvases, especially when you consider all the wonderful talented cardmakers that join this challenge. Thank so much to the ladies over at The Friday Mashup. What a fabulous challenge today, Autumn is in the Air. Create a project with an "Autumn" theme. 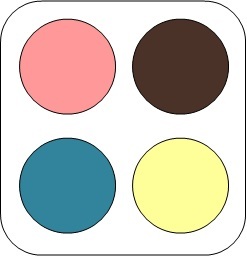 Or Create a project using shades of "Yellow & Orange". 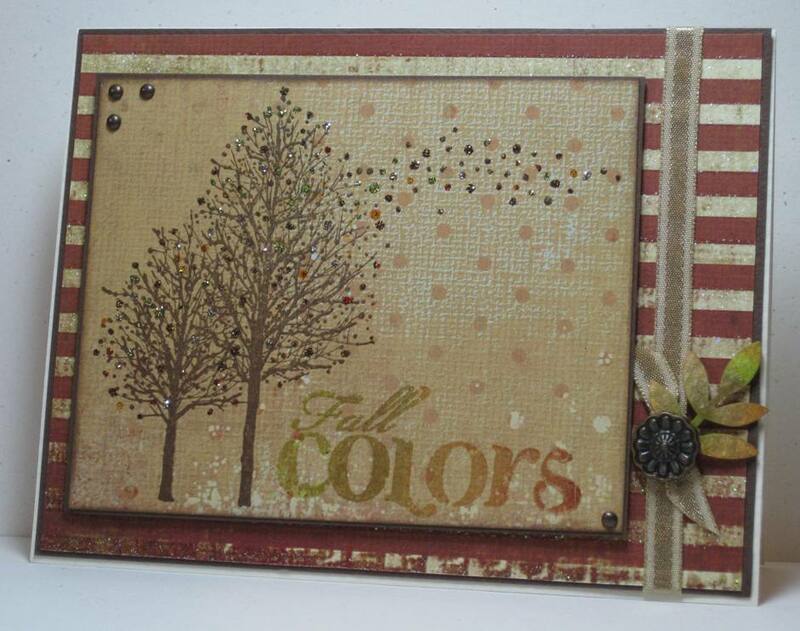 Or "Mash it Up" and create a "Autumn project using shades of Yellow & Orange". I love Autumn, love love love it, tis is my favorite season. So I had fun making this card, this DP is another sheet of paper I have had forever. I flip by it often and always say 'I really should use that', I think I found it in a dollar store. I coloured the leaves with Orange, Yellow, Greens, Gold and Brown Spica Glitter markers, I did not manage to get the picture to show the little bits of shimmer. I coloured the tree trunk with water color pencils and inked all the edges. 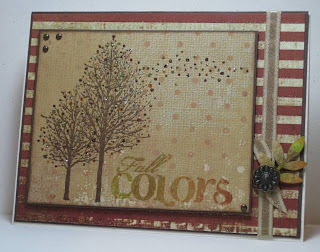 Supplies: Cream and brown cardstock, Designer Paper-Frances Meyer Inc, Whipper Snipper Designs-Fall Tree, Inkdinkado-Fall Sentiment, misc ribbon. A quick post for 365 Card Challenge Day 197- Beautiful Beads. The challenge: Use BEADS on your card - any kind of bead will do. I used a beaded ribbon. Simple layers, I have no idea what DP this is but there is a shimmer to it that is so beautiful. I used a Cuttlebug folder to add texture to misc sections. 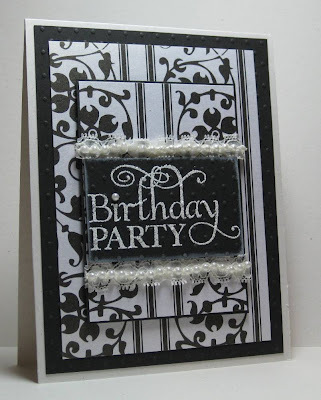 Supplies: Natural Ivory and black Cardstock, Designer Paper-Unknown, Fiskars- Birthday Cheer, misc ribbon with beads. Mid week already, love that. 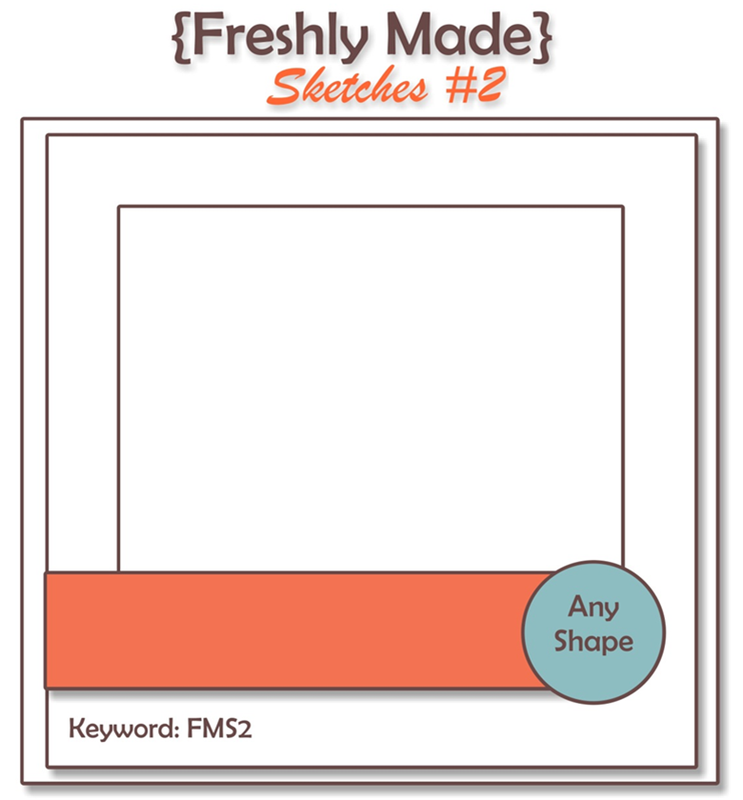 It is also time for a new challenge over at Freshly Made Sketches. This is today's sketch. Last challenge had some amazing cards, love all that inspiration. 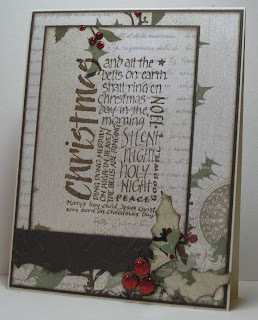 I am trying to get some ideas for this years Christmas cards, I love this DP and brought a good number of sheets so I though I would see what I could come up with.﻿ I used a holly die cut embossed with clear embossing powder as my shape. Stop on over at my sweet sisters blog, Barb completed all the challenges for 365 card challenge last week AND she﻿ also is a spotlight designer... well done Sis. Supplies: Cream and brown cardstock, Designer Paper- Memory Box, Slice, Magenta Crafty Individuals-Christmas, misc glitter dots, Candy Cane Stickles, Cuttlebug embossing folder. I decided to try a gate fold card. 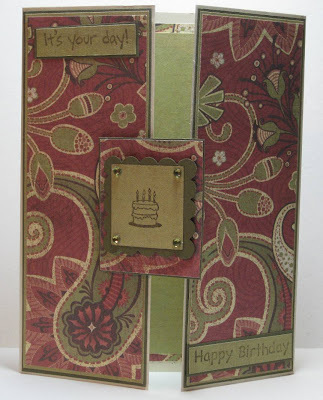 The 5 parts to my card are, two flaps, two separate sentiments and the centre focal point-the birthday cake. 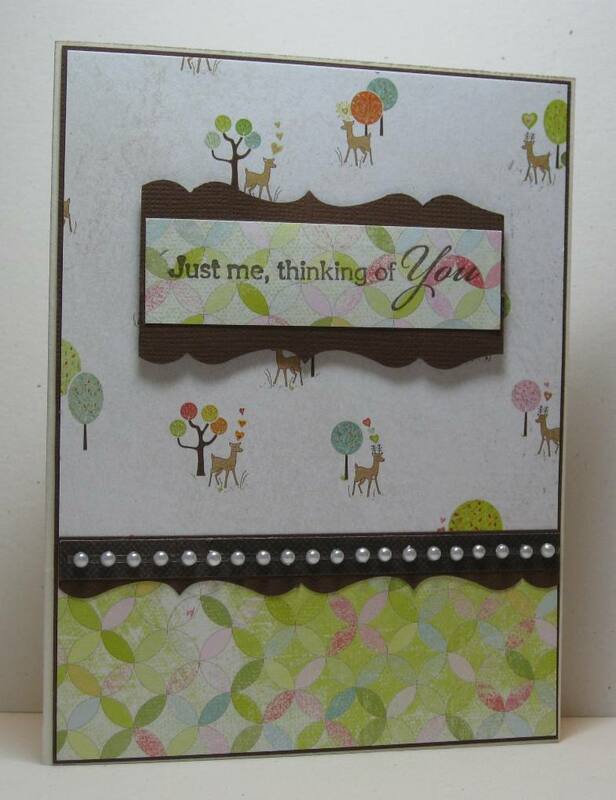 Supplies: Cream and green cardstock, Designer Paper-Memory Skor, Hot off Press- Tiny Words and Images, Kaisercraft gems. A super quick Sunday evening post. Supplies: Cream and brown cardstock, Designer Paper-Memory Box, EK Success edge punch, TPC-Card Craftng Hello, Kaisercraft pearls. I know this post is quick on the heals of the last post but I wanted to get this card up. I have missed a couple of the 365 Card Challenges but I had a idea for today's card. "You know you have one - maybe it's classical you like, or even classic rock. I have a mix on my playlist, but there's always a favorite (if only for a short while) at the top of it." On a little yellow blanket, just you and I.
I think it reminds me of growing up in a small town. So for the card I have a beautiful yellow background of sunflowers and a little honey bee. My mom loved sunflowers, I don't ever recall a summer when they were not growing in the garden. It will be nine years tomorrow since we lost her to cancer. I miss her everyday, I made this card thinking of her and her sunflowers- the whole time with a smile on my face. 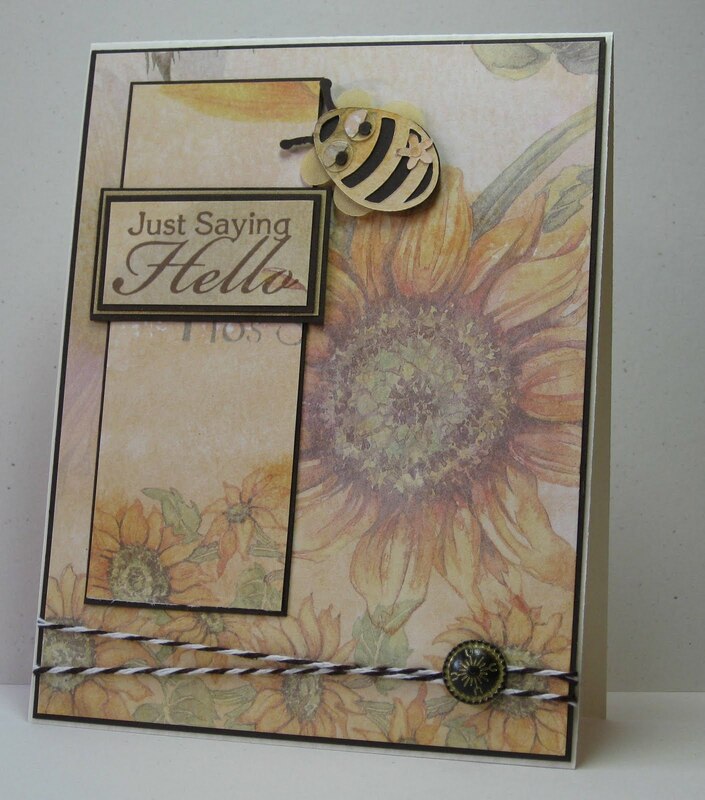 Supplies: Cream and Brown Cardstock, Designer Paper-PSX-Sunflower Montage, SVGCuts-Honey Bee, TPC Studio-Card Crafting Hello, Stampin' Up!-Antique brads. Happy Saturday, we have beautiful sun today. There was some rattling and rumbling from an Earthquake here on the island yesterday. I felt nothing and heard the hoopla on the news but it sounds like some folks up-island got a little shake. I think I added an extra element or two but I like how the card turned out. I got a new Sizzlet Little Leaves die cut and I wanted to use it soo bad with some Creative tape to add glitter but it was not happening. I think the tape was a little too thick for it. I ended up using glue and adding glitter in layers, I love how the leaves turned out kind of chunky looking. 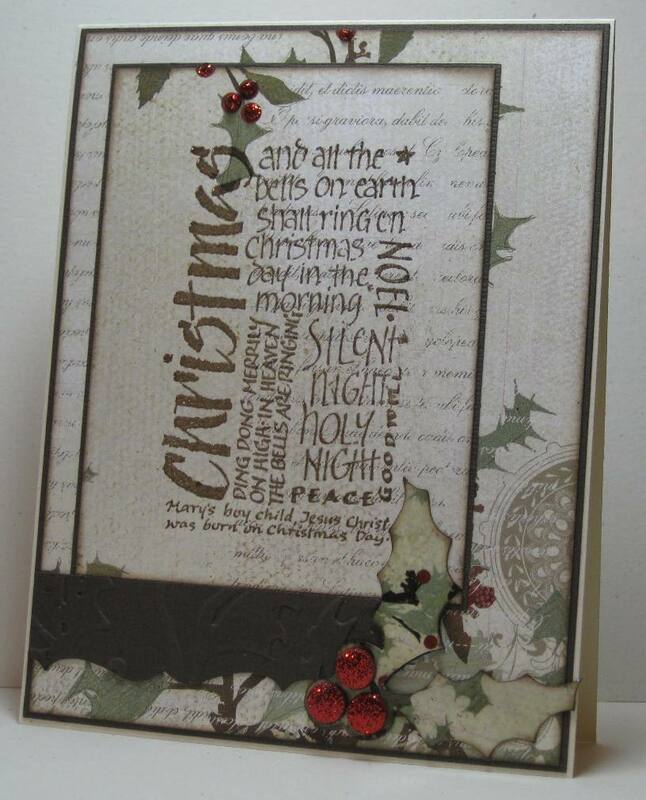 Supplies: Kraft and brown cardstock, Designer Paper-DCWV, Sizzlet-Little Leaves, Cuttlebug-embossing folder, Hot of the Press-Tiny Words, American crafts ribbon. EK Success- Edge Punch. Happy Friday, this week seemed to zoom on by. The weather has been amazing it is hard to believe that school started again this week. Clean and Simple, Vintage, Shabby Chic, Bold Graphics, Cutesy....Whatever your style, now I want you to do anything but that style. I rarely do stitching, real or faux, I also tend to stay away from brighter colors. Both of these are included in this card.. I also took it a step farther and made a smaller sized card 4 1/2 by 4 1/2 so I think I have covered the So Not Me. I did keep it basic though and I like how it turned out. my stitching is not real.. of course. I have had a few crafting mishaps this week and my luck I would sew my fingers together if I tried. I printed off a clipart apple and covered it in Diamond Glaze. 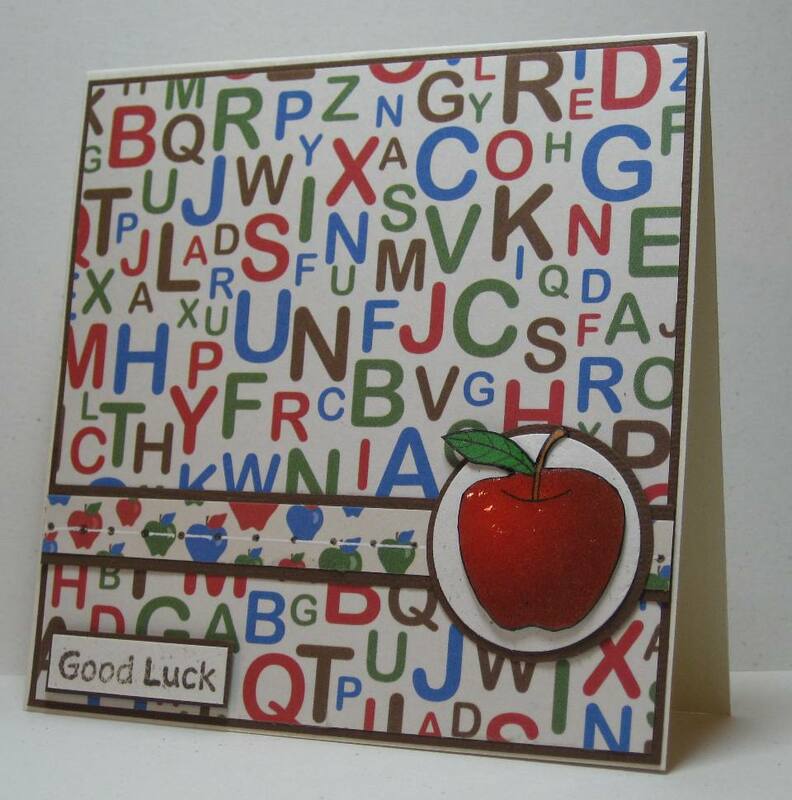 Supplies: Cream and Brown cardstock, Designer Paper-DCWV, Hot of the Press-Tiny Words and Images, misc apple clipart. Just a Note and a brand new card Challenge. Freshly Made Sketches is a new challenge and I am pretty excited that I can that I can participate right from the start. Please see the Challenge details on the challenge blog.. here. This is the sketch for today's challenge. I am pretty proud of the fact that I used one sheet of designer paper for the whole card. I thought I might try to mix and match from one of my 6 x6 packs but found this in my stash and it all came together. I do love double-sided paper. I cut out a couple of the flowers from the paper and made it three layers, the last one has some Diamond Glaze to give some gloss, the button is embossed with clear embossing powder. Supplies: Cream and brown cardstock, Designer Paper-Upsydaisy Designs, Sizzlits-buttons, misc floss, Kaisercraft pearls. 365 Card Challenge-Day 190-Card Recipe. I have never been very good at following recipes. In this case, I am not over fond of the results. I created 4 small buttons from a small EK Success leaf punch and embossed them with clear embossing powder and the beautiful leaf stickers are Jolee. I really don't show them off very well but they are darn sticky and once they were attached there was no un-sticking them without tearing them apart. 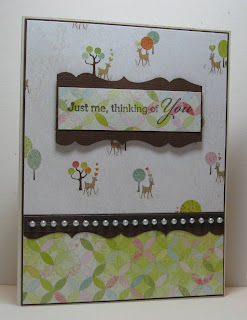 Supplies: Natural Cream and brown cardstock, Designer Paper-DCWV, Hot off the Press-Tiny words and images, Cuttlebug embossing folder, EK Success leaf punch, Jolee Dimensional Stickers. Good Morning - A quick post for a Clean and Simple Sunday Challenge. 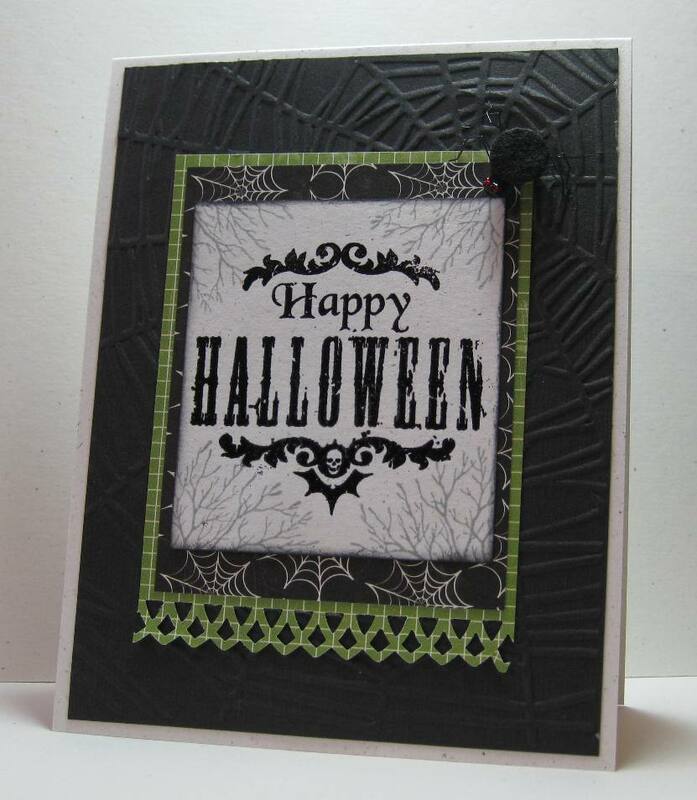 I started by using a spider web embossing folder to add a large web to the black background. 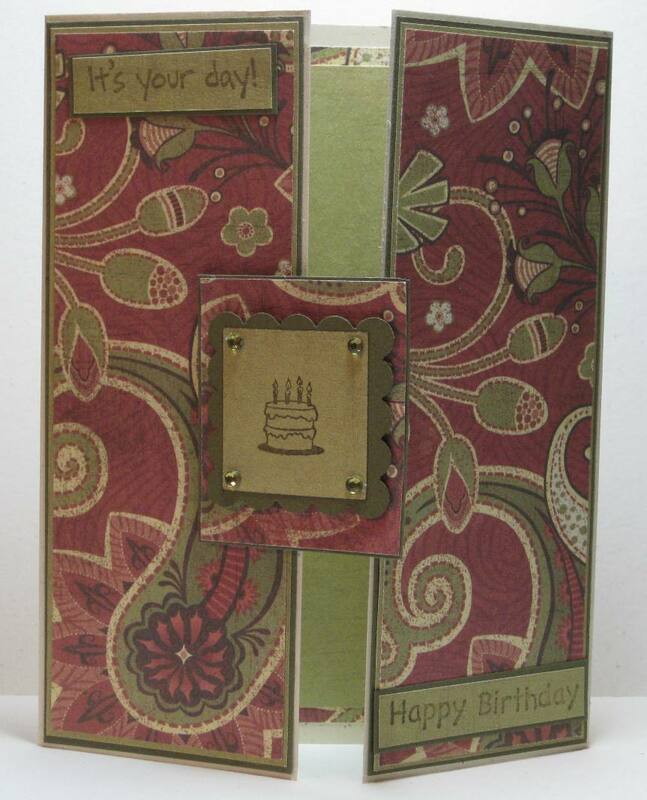 I added a couple of layers of designer paper and finally the stamped sentiment. I finished with a small spider embellishment. Supplies: Natural White and black cardstock, Designer Paper-Echo Park, GStudio-Halloween Harvest, misc tree stamps, Cuttlebug-Embossing folder, Martha Stewart punch, Jolee Spiders Web. Craziness, but I have caught up :). 365 Card Challenge- Day 189-Pattern Frenzy. The card Challenge for today is "to use SIX different patterned papers on your card. Exactly how you do this, and anything else you want to add, is up to you." I chose to do a Thank you card, a masculine one. I used my K&Company Recycled double sided mat stack called Remake Earth Browns. Stripes and buttons is the theme, there is one of each for each pattern. Of course my buttons are embossed with clear embossing powder. 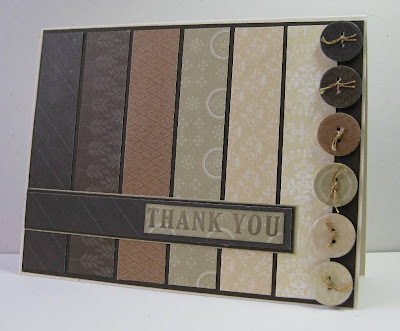 Supplies: Natural Ivory and brown cardstock, Designer Paper-K&Company, EK Success circle punch, Fiskars-So Much Thanks. A very quick second post, to play catchup for yesterdays 365 Card Challenge - Day 188-Super Sketchy Sunday. This sketch was a little intimidating at first, then I found that paper on the floor this morning and I though I would change the sketch a little and make it look like a Victorian Envelope. 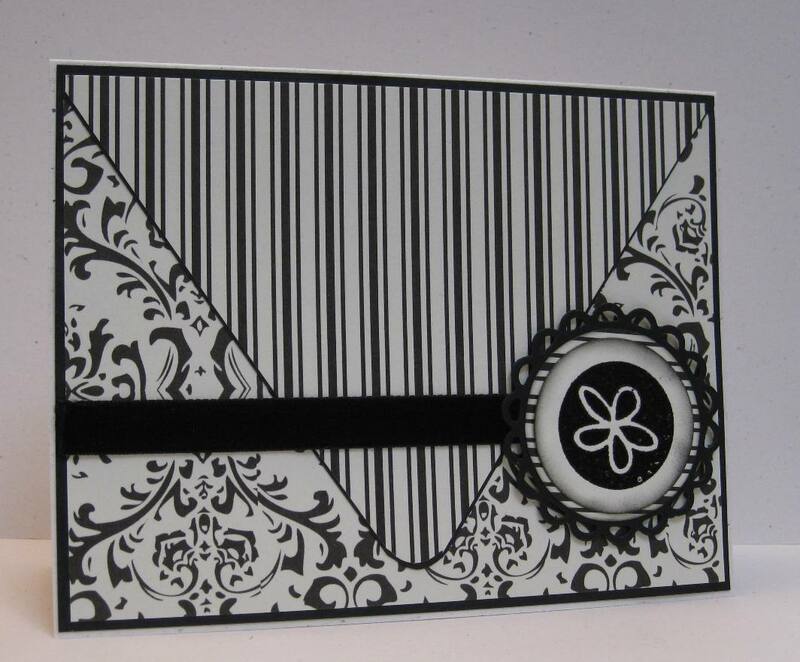 I cut all the designer paper and cardstock, added a black velvet ribbon. 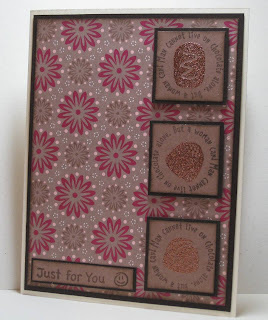 I used spellbinders dies for the circles and stamped and embossed with black the flower stamp. 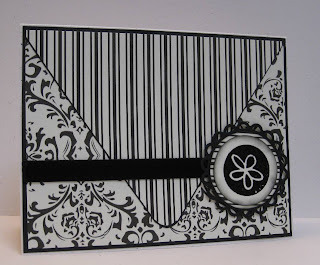 Supplies: Cream and black cardstock, Designer Paper-Unknown, Spellbinders nestabilities, The Stamps of Life-icon4us, black velvet ribbon. Hope every one is having a good Labour Day, I love long weekends. I am very fortunate to work Monday to Friday and get my weekends off. Two challenges for this post. 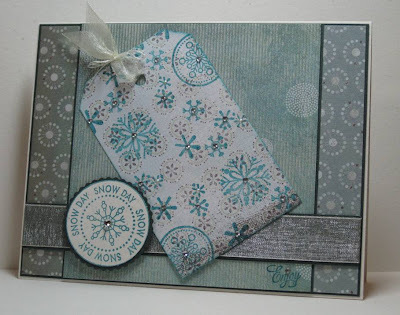 I am still behind with 365 Card Challenge so I thought I would combine Day 187 with a Clean and Simple Stamping Challenge. 365 Card Challenge-Day 187-Past, Present and Future. Pick an item/technique/tool from the past that you haven't used in a while. Use your favorite color at present and Use a theme that is relevant in your life in the near future (a holiday or upcoming event). I had to dig into my spare closet yesterday and in the process hit a small pile of craft stuff which did the mighty topple. This morning I found this fabulous Designer Paper that has a Vintage look, I don't remember even buying it and it has no labels or designer tags. I wanted to use it right away though. 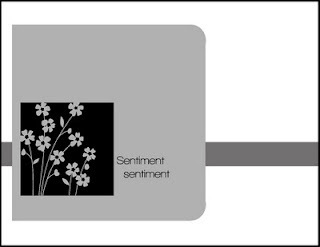 So, lets see for my the Past requirement, the Designer Paper, I am loving monocrome right now, so black/cream fit the favorite color, future-there is always room in the future for a card just to say HI :). The second Challenge is Clean and Simple Stamping FTL156. This is a sketch challenge. I turned it around and made it a vertical card rather then horizontal but I think I was able to follow the sketch pretty well. 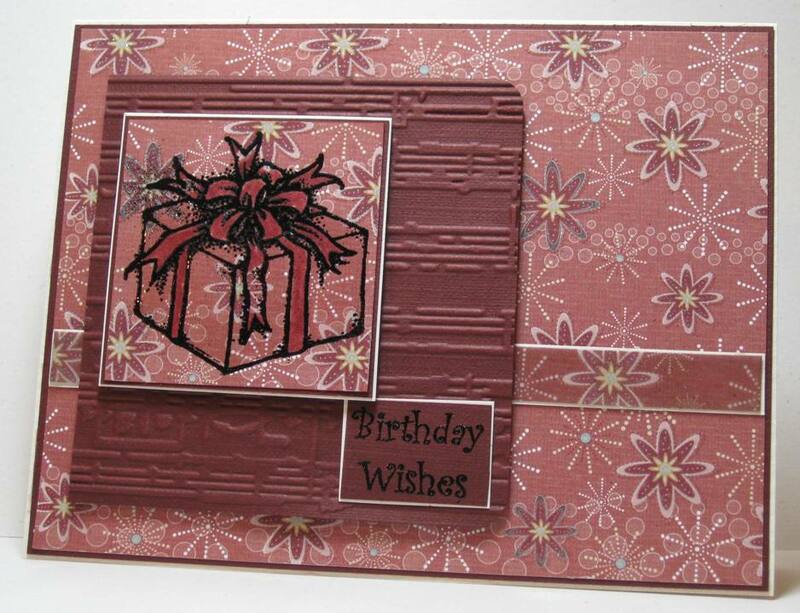 I embossed both the back ground and the small vertical strip with different embossing folders for extra texture and used and EK Success punch for the one edge. 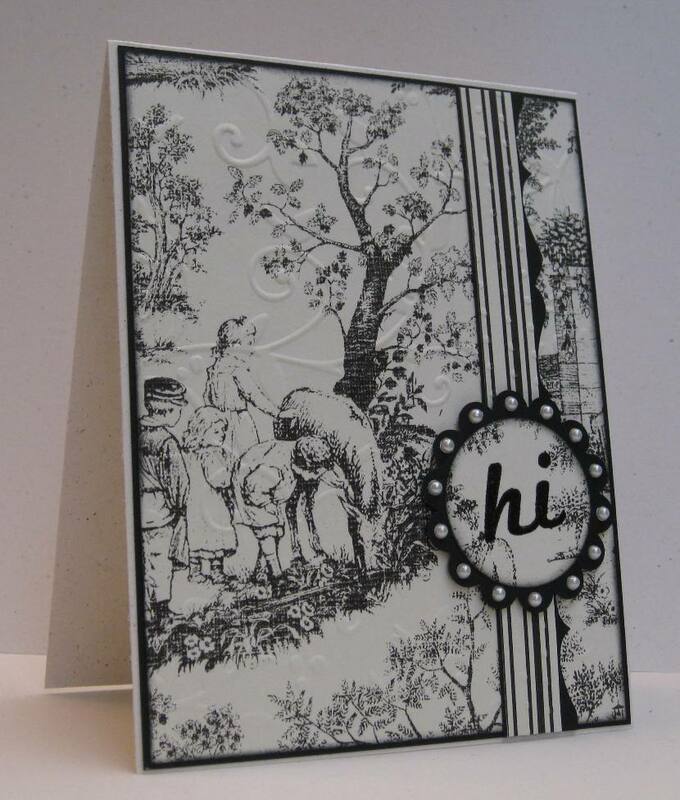 Supplies: Cream and black cardstock, Designer Paper-Unknown, The Stamps of Life-back2basics, EK Success edge and circle punches, Cuttlebug embossing folders, Recollections-cream pearls. Happy Saturday, the sun is shining and my son and I are going to take advantage by going for a hike. So this is just a quick post to play catch up for yesterdays 365 Card Challenge-Day 186-Pick a Pattern. 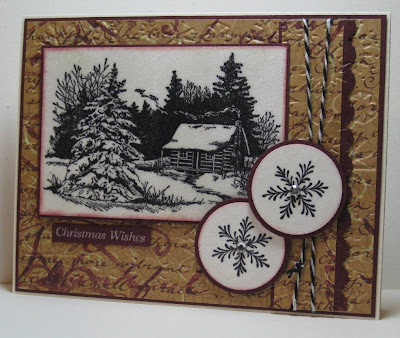 It's called Pick-a-Pattern because you need to create a pattern somewhere on your card using embellishments. I am still in Halloween card mode, I made a random pattern with my clear embossed bats that I cut with my Cricut and Sure Cuts a lot software. I could also say that my little dabs of Stickles on my scallop form a circular pattern. I used a circle punch to cut out my "moon" I embossed Trick or Treat in black, stamped some ghoulish trees in gray then edged with some Memento Cantaloupe. I used a EK success punch for the small banner edge. 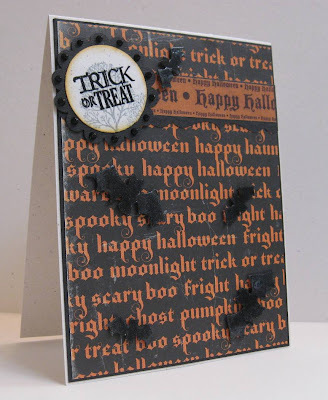 Supplies: Natural White and black cardstock, Designer Paper- Echo Park, Fiskars-Halloween Night, Stampin' Up!-Lovely as a Tree, misc punches. Rockstar.. who's a rockstar.. I am sooo excited because I am a ROCKSTAR. I am actually a little in awe, definitely amazed and incredibly pleased. 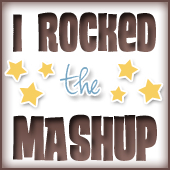 Thank you to the ladies of The Friday Mashup. -Or Mash it Up! 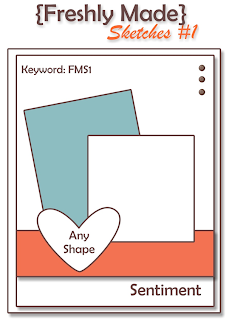 and make a card with a gate fold AND numbers! I found this fabulous designer paper while power shopping in Kelowna craft stores with my sister, my little trimmer has been buzzzing to get its blade into it ever since. 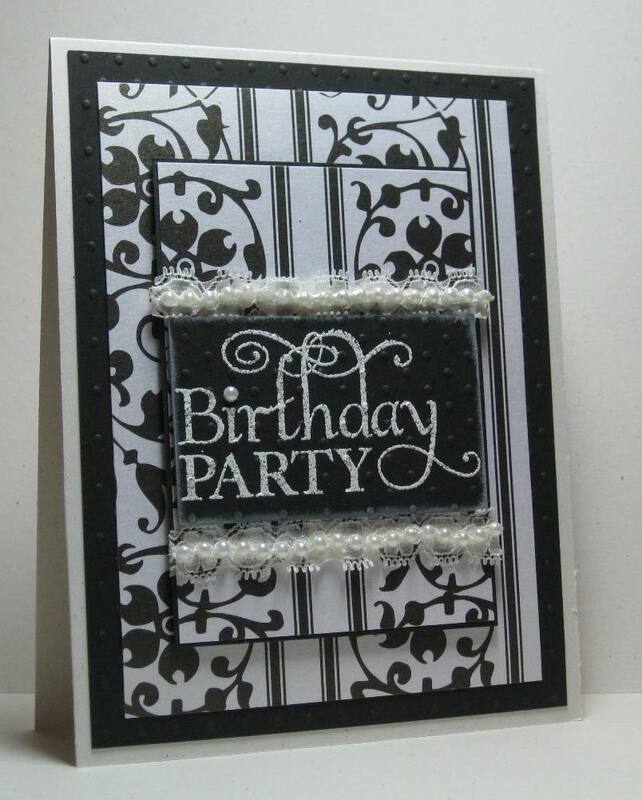 I went for simple or basic for this card but of course it would not be complete without a little glitter and glam. 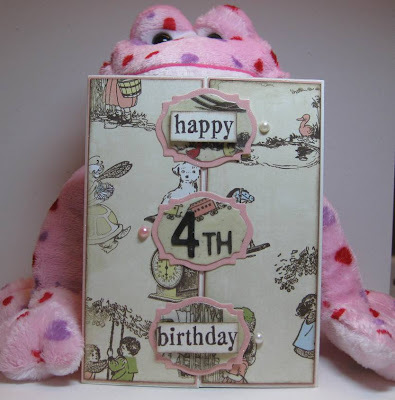 There is the cutest little lady turning four soon and I thought this card would be perfect for her. The three center elements were cut out with a Spellbinders die, the first layer out of pink glitter paper, the second designer paper that I embossed with clear embossing powder. The stamped sentiments were simply stamped with the edges ink with a little bit of Versacolor Pinecone the popped up with foam tape. The 4th was cut out with my Cricut and also embossed for gloss. I finished with a couple of pearls, the inside has a matching panel. The centre elements alternate to which side they open. I would have liked to add some texture to the panels but..well.. I forgot :). I had covered my embossing folder with paper as I worked... next time. 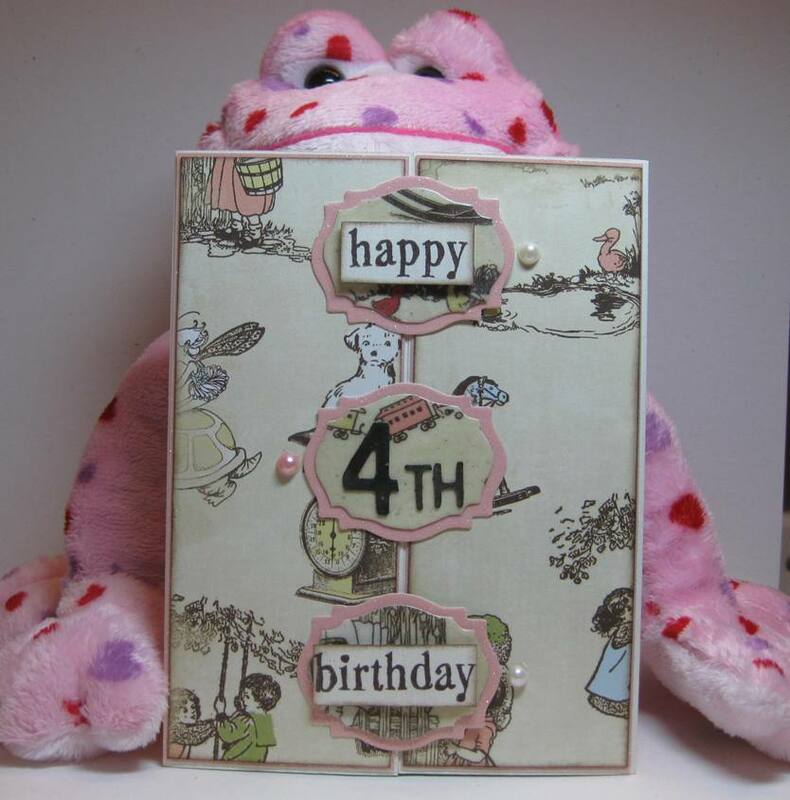 A special Thank you to Love Frog for patiently holding the card for its picture. Supplies: Cream cardstock, Pink glitter paper, Designer Paper-Websters Pages-Lullaby Lane, Spellbinders-Nestabilites, Hot of the Press-Mix your Message, Misc pearls. Gone Fishing for a So Unusual 365 Card Challenge tossed in with a little bit of Cards for Men. 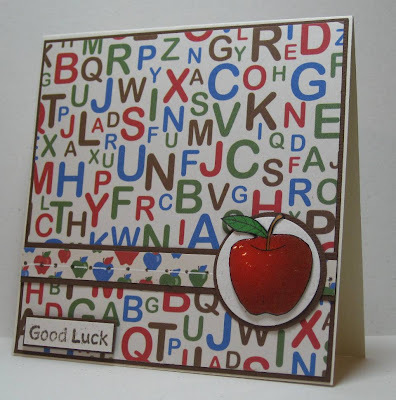 First Challenge is for 365 Card Challenge-Day 185-So Unusual-Create an unusual card shape - otherwise anything goes. 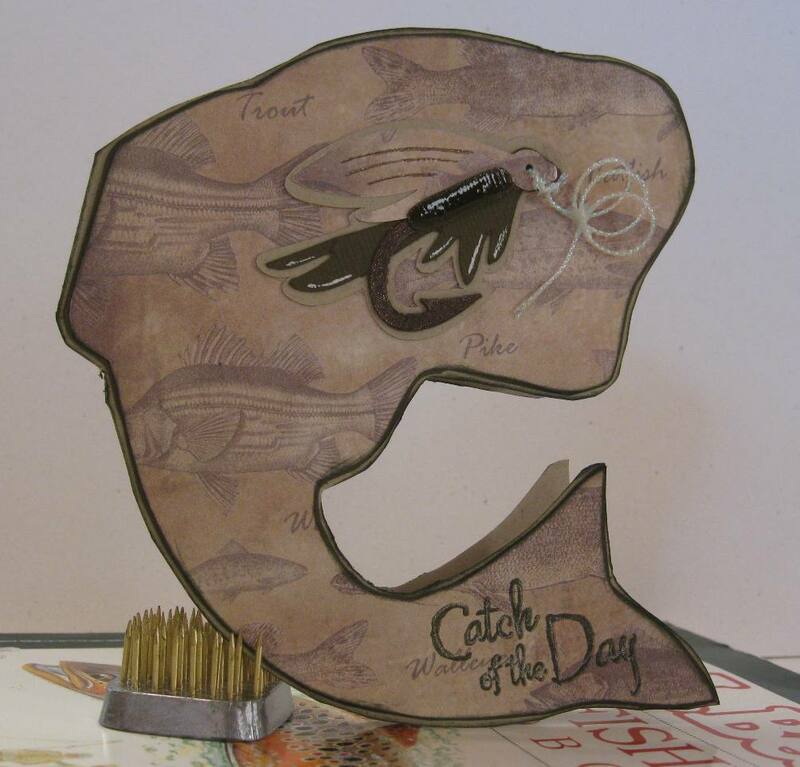 The second Challenge is for Cards for Men-Challenge 18-G is for....For my card it is a double G of Gone Fishing and Green. I knew from the start that I wanted to make a fish shaped card. My sister Barb created this fabulous big mouth bass shape for me, I printed it out then traced it then cut the folded card. I then traced two additional shapes and trimmed them till they created slight layers. The multi layer fly was free on SVGcuts today, how is that for good karma. I cut that with my Sure Cuts A Lot software and my Cricut. I added some sparkly bead thread as fishing line, then stamped Catch of the Day. 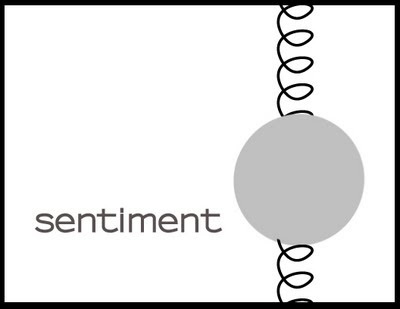 I figure I can add just about any sentiment to the inside on the fly... like that on the fly. I finished by adding a little Diamond Glaze to the fly, and coloring the hook with a brown glitter marker and also added a little glitter marker to the sentiment.